Here's a Holiday card which I created for a sketch on SCS #SC202. I tried to find the best possible colors to compliment these beautiful glittered Chickadee rub-on birds.... and ended up going with these heavy Cardstock colors from Making Memories and Stampin' Up!. I wanted brown tones on Green to accent with black and these were the nicest I had on hand. I Cuttlebugged the furthest panel (background) with the CB leaves folder (though its not really visible here). Finished off with silver brads and a rich brown ribbon. Added a SU sentiment from the set "So Many Sayings" to top border. What do you think of the End result? This is beautiful America!!! The colors are just perfect, and I love that strip along the top with the sentiment and brads!!! I really love this card! 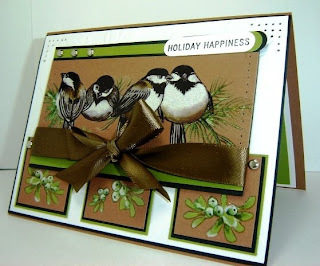 The chickadees and the colors go great together and it makes a fantastic Holiday card. They are just so gorgeous and I love the whole design! girl...this is awesome! I love birds. You rock! It´s a wonderful card, and this stamp is beautiful. beautiful! Oh I love this, awesome job on the sketch too. Absolutely Gorgeous!!!! Rub-ons are starting to be a regular thing in my card making.